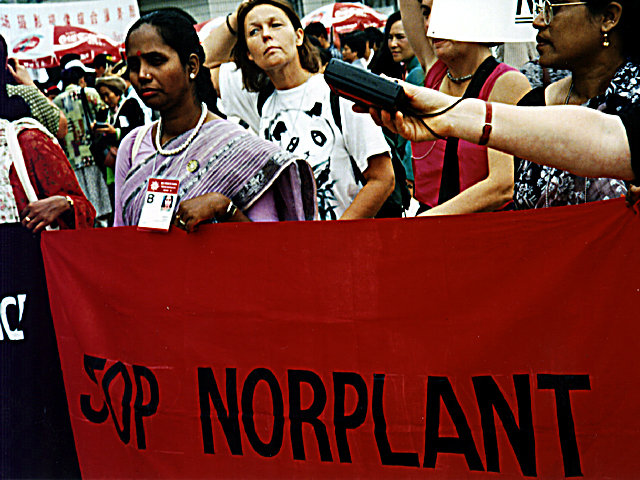 Salome Chasnoff is a documentary filmmaker, installation artist and media activist. She has been an arts educator for more than 20 years in university and community settings, and has produced more than 25 works, several dedicated to expanding media access to the diverse stories of women and youth. Chasnoff founded Beyondmedia Education in 1996 and after serving as Executive Director for most of that time, Beyondmedia was closed in early 2012. 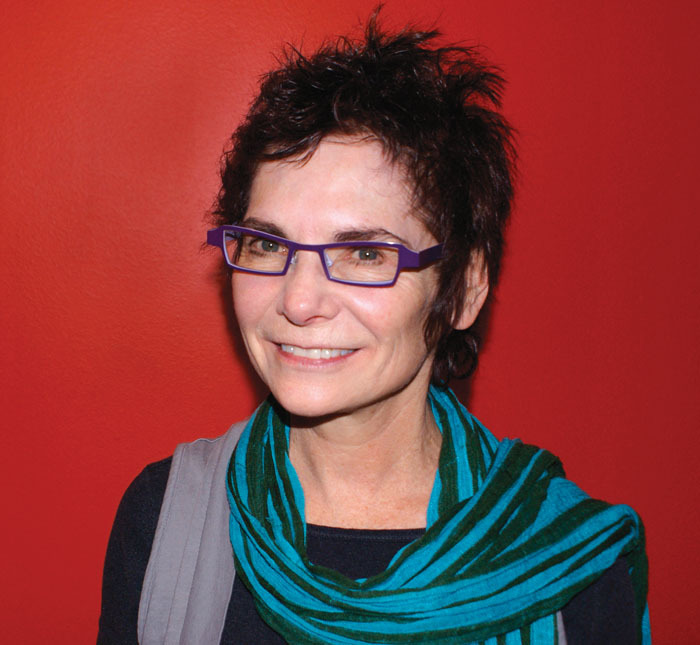 She was interviewed about the pre-histories and recent post-histories of Beyondmedia in June of 2012. For further information about Beyondmedia check out their videos here. Salome Chasnoff (SC): Something I was thinking about as I woke up this morning, is that uh, it’s just about art. As I was brushing my teeth, I was thinking about art, the word art, and you know, how artists are either put on a pedestal or treated pretty poorly and thought of as incidental, and maybe people.. adults stuck in childhood. That’s…that’s not how I think of art. And, I guess, my personal life and also my… the way I guided Beyondmedia was with the understanding that we’re all artists, and art is not something that’s sequestered in kinda like a specialized corner of life. It’s really about how we approach everyday life and how we express ourselves and.. I don’t mean to suggest that I don’t admire the skills that people have and that they develop and continually work to perfect in the expression of art, because I absolutely do admire wonderful pieces and stuff that just takes my breath away. But I also think that, you know, we’re all capable of surprising ourselves and each other through things that we, activities that we call art. You know, I’ve seen stuff made by students that just blew me away. Young people. So, I think, yeah, I think I’m like, at a place where I wanna think of myself in that context as well, ‘cause I am. And I also, I’m in this place where I need to make money in a new way, and I’m kind of, you know, doing more paid work. And I wanna keep thinking of myself as an artist, and not just as, you know, a person who does this for a living. Daniel Tucker (DT): Lets start with the prehistories, your personal prehistory of Beyondmedia, I guess I’m not even looking for the founding story or that kind of thing, but more sort of like what kinds of artistic or activist kind of practices did? What were you engaged in before Beyondmedia that ended up being influences for the kind of practitioner you’ve become? SC: Okay. And it’s interesting because I think there’s always been a push pull, not a push pull, but a dual process in my evolution as an artist and as an activist, and sometimes they’ve been discrete, sometimes they’ve been enmeshed. I have a background in theater, in the late 80s—and also performance art, I did performance art in the 80s and 90s. And in the late 80s I started using photography and film and video in my live performances. DT: And was that here in Chicago? SC: Yeah. And it was primarily in grad school at Northwestern– so that’s where I did it. But I also did it in, you know, in other venues in Chicago, and also in New York. I did theater in New York in the late 70s. So..
DT: So did you go to college and then take time and then go get this PhD? SC: Yeah, I went to college. I quit. And then I went back when I was a little older. So in the late 70s, I was at NYU and I was doing theater, a kind of avant-garde theater. And then I left NYU and came to Chicago, and I still hadn’t finished college. And then in the mid 80s I went to Northwestern and I finished my Bachelors. I kinda fell in love with school at that point. And I finished my Bachelors and went on for a Masters and PhD like, just straight through. And I was in theater all this time. DT: And then did you transition to performance studies when it became a PhD? SC: Yes, exactly. Yeah but, first as a Masters student. My Masters was an interdisciplinary performance studies/theater degree. So I was, I guess, I am a woman in transition all the time, but so I started doing performance art in the mid-80s and then at a certain point I began incorporating first photography and then film, like Super 8, and then video. And I just really was in love with, well, I’ve always been, the thing I’ve always been in love with is the process of making something. Not necessarily engaging with an audience, but what leads up to that. What leads up to opening night, and then opening night. And I’ve also always been really attracted to the ability to do the whole thing. Either myself, or with somebody else or with two other people, but, being engaged in every aspect of the process of making something. DT: Well, did that lead you to kinda transition from theater to performance? DT: Because performance is more boundless in terms of the roles? SC: Yeah, exactly. More fluid and also it can be kept much smaller, it can happen anywhere. I mean, theater can too, I don’t mean to put these artificial restrictions on theater, but. Also kind of the theater tradition I had come from was very script-based third-person and you know, I think in performance studies I was being exposed to everything that wasn’t traditional theater, and I just wanted to try putting it all on its feet, I guess. I went through a period where I was performing the work of Gertrude Stein and Diane Arbus. I became really interested in solo women artists and wanted to try to transmute their work into another form. So I transcribed some of Diane Arbus’ writing into a performance modality, and then like played the script in different settings, like in a dark room, in a lecture hall, in just this kind of amorphous space, and I used photos and kind of interacted with the photos. And then I went through this Gertrude Stein period, and actually I did a solo performance of one of my pieces at the old Randolph Street gallery, but I also used to do pieces with my performance partner, Penny Farfan. We did stuff at academic conferences, and this was kind of before people did performances instead of papers, and so they were received, our performances were received with a bit of controversy and distraction, I would say. For example, we did this one piece that was… the texts were taken from The Autobiography of Alice B. Toklas and Alice’s Cookbook, those were the primary texts, but we kinda took some stuff from The Making of the Americans, so we called it The Gradual Making of the Autobiography of Alice B. Toklas. 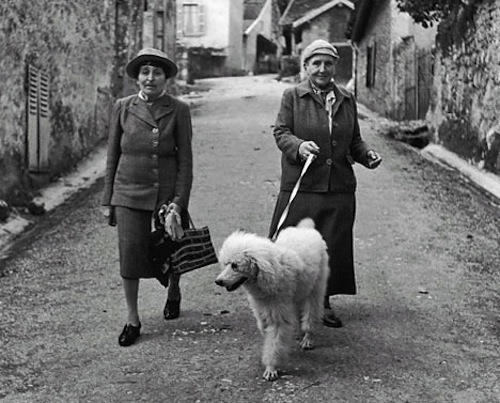 We also incorporated an image of Gertrude and Alice walking their dog, Basket, which we thought was pretty funny. There’s actually a review of the performance in Theater Journal or one of those and it premiered at Block Gallery. And we intercut.. so we played Alice and Gertrude, but it was kind of this shifting “I” — the first person, we shared the first person voice, so you never knew, even though we were kind of.. the way we were dressed, we each suggested one of the characters. We kept shifting identities between us. And we just sat in these two sling chairs, but we had these two TVs on either side of us, so we intercut our live performance of these characters sharing identity with– we had documented the rehearsal process. So the TVs played very brief scenes extracted from the whole process of making the performance. And I remember being at some conference, and there was like, everything was pretty.. okay, so our performance reflected how it happens in Gertrude and Alice’s relationship, where conflict is repressed. Well, in our video documentation of our process, we make this one really brief reference to our “one bad day.” We don’t actually show the bad day. We, like, reference it in a conversation we’re having. And the performance was really complicated and kinda entertaining. And people would always get fixated on the one bad day. 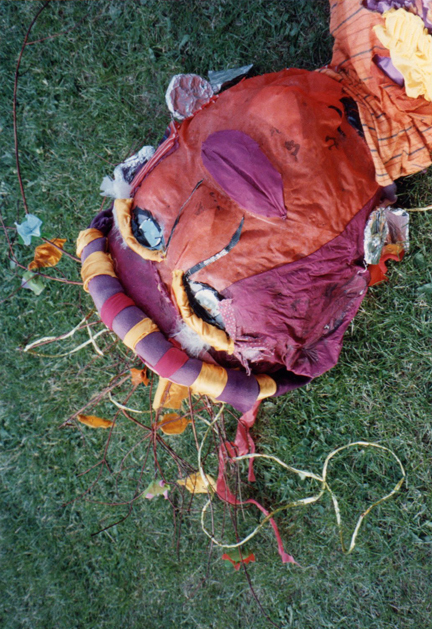 Speakout for Reproductive Freedom – close-up of giant puppet, Freedom. Let me just say a bit about my activism at the time. A lot of it was really what we thought of in those days as feminist activism. I organized an event in the early 90s, a Speakout for Reproductive Freedom. It began across from Clemente High School. There were people speaking about different aspects of reproductive freedom, everything from freedom from forced sterilization to access to appropriate healthcare in prison. So it wasn’t limited to abortion rights by any means. We had built this giant puppet we called Freedom with Sabrina Craig and others and we had this march up Milwaukee Avenue. And then we had a whole night of protest performances at the old Hothouse on Milwaukee celebrating the freedom to reproduce oneself through art. So that went from like 6 p.m. to 2, 3 in the morning. It was great. So I’d do things like that. And then the teen moms I worked with was really the seed for Beyondmedia, but that was another kind of activism where I was teaching young women how to use video to attack, publically attack stereotypes that involved their identities. That work started when I was in grad school. So I.. one of the things that had happened when I got admitted to into the PhD program at Northwestern– It was like, within two days, I was admitted into the PhD program and I discovered I was pregnant. So, I started grad school, and I was having trouble separating my critical life from my physical life. And I was having dreams, I remember writing about this in the preface to my dissertation, I was dreaming that…I had grown up in New Haven, Connecticut, and I remember in this dream I was standing on the top of the stairs at the Yale Co-op bookstore, and I had to choose between Dissertations and Collections, and I was paralyzed at the top of the stairs. And there were these two opposing directions—it was one of these kinda classic corny dreams—and I was paralyzed at the top of the stairs, I couldn’t figure out which way to go. And at the time I was also running the costume shop at Northwestern as my Adjunct job. I think I was just processing this kind of conflict between the need to critique and parse and argue (all the activities of being a grad student) and the need to contain, to enfold, to find peace, that are required of people who are pregnant. And it was a challenge– until I decided to write on birthing. And then everything began making sense, and it became really livable for me. And so I kind of looked at birthing in multiple genres, like the Speakout for Reproductive Freedom was an expression of my research, as was a project I did with a group of girls that were students at Evanston High School who had become pregnant. And some of them, it was their first, some their second baby. DT: And how did you get kind of connected to these young women at Evanston High School? SC: They.. what happened was Evanston High School had a program at Family Focus. Family Focus was a place in those days, if you needed, like, time to connect with other adults or write a letter or whatever, you could go to this place and they had a room for kids under four and a room for adults and, so it didn’t involve having to get a babysitter but you could go there with your kid and hang out. And I used to go there with my daughter sometimes. And I learned about this program that they had for girls who had become pregnant as students. Because what happens is, I think after the 5th month, 5th or 6th month in those days, you couldn’t go to high school anymore, you had to do an alternative high school program that goes between the 5th or 6th month of pregnancy and one month after delivery, because of all the restrictions, I guess, insurance, but also all the needs of the young woman. Like, she needs to go to the doctor, she can’t maybe do gym, some of the gym activities. So they went to this alternative program that was in the morning, and in the afternoon they could take care of their appointments or whatever. And so I volunteered for that program and I worked with the girls for a year. And we did all kinds of things. The first few months we just explored the topic of teen motherhood from a number of different perspectives. We read plays that had been written by pregnant teens and young moms, and plays that had been written by adults about the topic. We read articles, we developed a series of questions and did a radio interview-based project with a number of people. We did a lot of talking. I would bring healthy food, we would sit and eat lunch together and talk about how to take care of yourself. DT: Just to clarify real quick, is, so was this sort of something that was happening kind of informally, or was it something that you were sort of developing kind of under the auspices of your PhD? And also was it all happening at Family Focus, were they somehow facilitating this collaboration? SC: So I did it as a chapter of my dissertation.. I was doing this project as a chapter of my dissertation and I didn’t really have, at the beginning I did it organically, I didn’t really know where it was going. I just wanted to explore cultural stereotypes surrounding early fertility and teen motherhood– and through the experience of this very small, specific group of girls. And I was partnering with the coordinator of the program. So the program had a coordinator and the girls were taking classes, and I was just their last class. It was like an add-on. And that’s how the food thing started, you know.. by the time they saw me, they were hungry. So, I would just bring food for them and we would sit and eat together and talk. And that’s how we would start. I would kind of figure out what they were interested in learning and what they wanted to do. So we just did, like, a multi-month.. I think we would meet once a week, and we did this multi-month exploration of cultural perceptions of teen motherhood, and how those perceptions mapped against their own experiences. DT: And what form did that take? SC: Well, ultimately what happened.. at the beginning of the project, I was just getting into video. 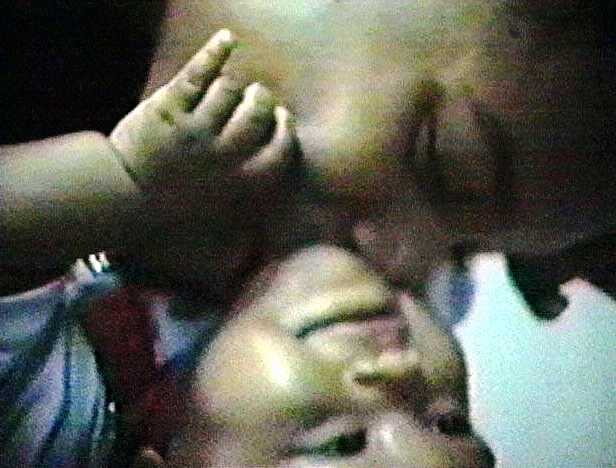 I was also doing the Gertrude Stein piece with video– I think that might have been the only video I had done. So at the very beginning, I said “well, let’s make a video!” But they were not at all interested because they were all pregnant and the last thing they wanted to do was get in front of a camera. But towards the end of this process, I showed them a piece, when they were all starting to have their babies, I think most of them had by this point, maybe all of them. I remember it was a really rainy day. There was a lot of people in the room ‘cause there was no school that day and so they had friends there and their kids were there, and I showed a movie that had been made by a group similar to theirs in New York. And they were really upset about what they saw in the video. They felt first of all that the girls in the video were just saying what the adults wanted them to say.. it was like a cautionary tale about teen motherhood. But the other thing that made them, that struck them as being wrong or not truthful, was that the girls didn’t express any love for their children. And it was very hard for them to understand how they could have these little kids and not just be in love with them. They didn’t get– even though sometimes it’s really hard and you’re really angry at them, and you don’t have enough resources and you don’t have enough support, and life is super stressful, and everybody, a lot of people have a lot of criticisms of what you’re doing, you still, there’s still moments where you feel passion for these people, these little people. And they didn’t see any of that in the video. And at that point they decided to make their own video. So we made a piece. They ended up calling it, they ended up naming their group “The Fantastic Moms,” and they called the movie “Looking at Teen Motherhood: the Fantastic Moms Video.” And it was great. We actually, it happened pretty quickly, because we had been doing so much research and processing that when they went to make the video, all their ideas were right at the surface. And they made this short piece, it got into festivals, I think that was the first piece I got into Women in the Director’s Chair. That was another bit of activism I did, I spent the whole 90s in, very involved with Women in the Director’s Chair, after getting, putting my own work in there, I got very involved in the program committee, and then I became chair of the board. I joined the board and then I became chair of the board. And so I was very involved with Women in the Director’s Chair until Beyondmedia started. DT: And was that, was Women in the Director’s Chair, was that your first experience with…. DT: Right. You had to get exposed to it somewhere. DT: I wanted to move a little bit into Beyondmedia. We can go into this however you want, but my understanding from everything I’ve read is that there is this, that the direct pre-history of Beyondmedia is some combination of experiences that you had, working on this Fantastic Moms project with young people, and then going with a group of women to Beijing and then making a documentary about them going to the UN women’s conference. Can you share more about this? SC: Another important piece of it, I had been working that Dalida Maria Benfield who is, to this day, a really good friend of mine. And we started working together, actually, she worked with me on the Fantastic Moms piece. I think that was our first piece together. 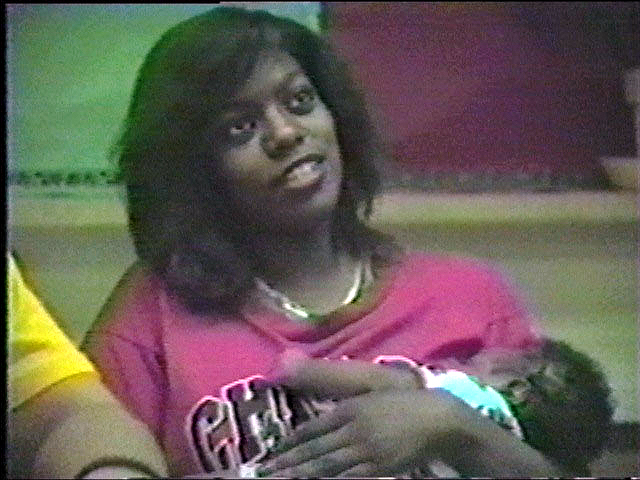 Then we did a piece together about the Chicago Community Midwives, another defunct organization. DT: So in that kind of work it’s like you and Maria Benfield were basically collaborating on video work together? Co-directing documentaries. SC: Yeah, so I had shot Beyond Beijing when I was in China, and when I came back I actually worked with a couple of people that were collaborators here in Chicago in the editing process. One was Beth Berolzheimer and one was Maria. It started from my experience in China.. It became really clear to me that women were just left out of this information revolution that everyone was talking about, in terms of equipment, training, access, everything. So Maria and I got this idea to start an organization called Women’s International Information Project, WIIP (whip), we called it. And we did a few projects. SC: Okay, one project that, lemme think one second, one project…okay, so in 1999 we went to the Encuentro Feminista in the Dominican Republic, which was a conference of women from Central and South America, primarily, some from North America, a feminist conference. And we did kind of guerilla workshops where we brought equipment, women came, we taught them how to use it, and they documented the conference and did whatever, whatever came out of the media. You know, there were different outlets for it. At that point, streaming, you know, putting something online was really in its infancy. And then another thing, I, well I went with Charlotte Saenz and Prudence Browne to Chiapas, and we worked with La FOMMA, which is Fortaleza de la Mujer Maya, La FOMMA, under the auspices of WIIP. And this is a group of Mayan women who use theater to look at problems of sexism and racism, etc., in their rural communities, but also as indigenous women in the city who moved to the city to find work. So, issues like violence against women, son privilege, like that. So we raised money, bought equipment with the money, traveled to San Cristobal de las Casas and worked with them and taught them how to use the equipment, made a promo of their work and left the equipment with them. DT: So was that, that was with Charlotte and Prudence as part of WIIP? SC: Yeah. So I did a few things like that. Lemme just say the one.. at a certain point Maria and I understood that women in Chicago were just as isolated from this information revolution as were women around the world. So, we decided to focus our energies here. And so we worked with another, yet another defunct organization, WHEP, Women’s Health Education Project. It was a community-based health education project. DT: Now, to just kind of clarify a few things about kind of like the social orbit around WIIP. Were, my understanding is that Prudence was involved with Street-Level Youth Media then, and then Maria was involved with Video Machete then? SC: That’s correct. Prudence wasn’t involved with the WHEP project. It was just Maria and I that started WIIP, and then we started reaching out, working with other people. SC: Synergy amongst the arts organizations? DT: Yeah. So, you’ve had this experience doing—you’ve got the background in theater—but you’ve had this experience doing the project at Family Focus and then that kind of developed into that and the experiences in Beijing and traveling to these other places kind of are the projects of WIIP. And then there are, you’re working with these people who are also part of the emerging youth media landscape, across the city, which is becoming in a way quite strong at the time (you had contacts with Video Machete and Insight Arts, but there was also Street-Level Youth Media, Coop Image, and other orgs). SC: And then the third, the only missing piece in your narrative was that the girl, the so-called “girl-child,” also received prominent focus in Beijing. This was a whole new idea for the women’s movement.. to think about girls. DT: Huh, okay. That’s important. So, I guess what I’m kinda trying to transition to, is, you’ve got this, you know, you’re starting to get experience in these ways of like, you know, sort of doing media, kind of community media projects, and then working with these people who are sort of from other community media projects, how did WIIP and these experiences and these kind of relationships that you’ve got around town, how did that kind of lead to the decision to start an organization that would sort of be a more Chicago-focused media organization: Beyondmedia. SC: Hm. Okay, I’m going to try to answer, but tell me if I’m not answering the question. But, I, during that period, from ’98 to 2000, I was teaching at the School of the Art Institute. I taught art education and I taught in the video department. And, as I said, I was involved with WIIP as a project that had the tone of a nonprofit, but it wasn’t. It was just really a collective project, it was project to project. 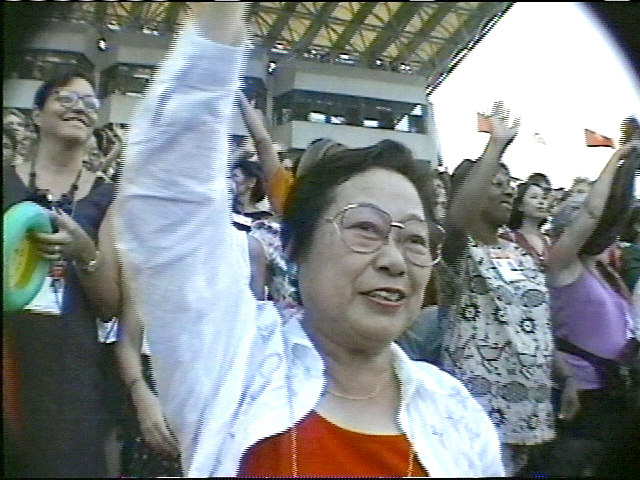 But during this time I had incorporated – as a for-profit – Beyondmedia Inc. as a vehicle, I guess I did that in ’96, as a vehicle to distribute the documentary that emerged from my experience at the UN Fourth World Conference on Women in China. So I had this, I was teaching, I had this for-profit, and I was doing this collective art-making work. And I, okay…and the other thing was, Beyondmedia Inc. was actually making money from distributing this movie. It was one of two professional films that came out of the conference, and there were, you know, 40,000 women there, 50,000 by some counts. Not all women, I shouldn’t say women, but mostly women. But a lot of them were organizational leaders and teachers that needed some kind of media to teach the conference and the issues that were raised in it. So I was selling movies. And I also, at that time, did…at the end of this I started, I was also getting involved in anti-prison work. I was hired to do three short films that introduced incarcerated women to Chicago-based resources that they could use for re-entry. And I began building relationships with women in prison, formerly incarcerated women, organizations that served them, and people involved in anti-prison activism. I had also developed a relationship with Joanne Archibald, who had participated in the Speakout for Reproductive Freedom in ‘93, and we stayed friends. So, in, I think it was ‘99, we decided to do a video with the women at Grace House. And it started out as a WIIP project. And it was some time during that period that I realized I was really duplicating my work between Beyondmedia and WIIP. There wasn’t really any separation between them anymore. So I decided to incorporate Beyondmedia as a nonprofit, and have WIIP be absorbed by it. Cause by this time Maria had left town and the people that were there, it was really project to project. DT: I’m a little unclear, was Beyondmedia Inc, in addition to doing distribution, were you being hired to do kind of like, as a production company? SC: Yeah, I guess it’s a product of my personality, but I, and it can be a problem.. On the one hand, I think what’s good about it is I don’t really see.. everything is connected in my mind, I don’t see divisions between things that easily. I’m more inclined to see how things are connected. And, you know, I did, out of high school I went to University of Chicago, and I did general studies in the humanities, you know, and I always did integrated education and, I was very, um, interdisciplinary in my approach to things. And kind of the fallout of that is that I feel like everything I do passes through my body and I don’t really see the, how they are, should be, can be, separated. Yeah, okay. So the year that we were working on what turned out to be What We Leave Behind, which was a video Joanne and I did with the women of Grace House.. 2000.. that was the year that I incorporated Beyondmedia as a nonprofit in the state of Illinois. And then in 2001 we got our 501(c)3. DT: And then from that kind of transitional period where you started trying to bring some things that were previously disparate together under an umbrella of Beyondmedia. Can you stay focused on that kind of transitional moment after the project with Joanne where you sort of incorporate Beyondmedia, and what changed now that you’re an organization, kinda like, what become the goals of this organization? Like, what is it, what was it gonna do, or what was it doing early on? SC: It’s so interesting, because I think, you know, there’s the mission, but there’s also the impetus. And they’re not, they’re two levels of desire. But I would say the, can we not talk about the mission for a minute, and just talk about the reason, like which is your question? DT: Yeah, it’s good to be clear which one you’re speaking to. I mean, yeah, that’s what, we don’t need to, you can take that wherever you want. But yeah, what were the intentions? I can understand the impulse to sort of want to tidy things up, like, oh, we’ve got these two or three different things, and they’re basically the same, so let’s create an organization, kind of for convenience, for clarity. But sort of beyond that, I mean, you have to go through some process of thinking, well, what’s it, is this thing going to be sort of something more or is it going to continue to be a platform for an eclectic range of sort of interrelated things, or what are those sort of objectives, you know? SC: Yeah, I think it was, there were kind of multiple overlapping objectives, or at least desires. I think one very obvious one to me and the people around me was to create a space for collective artmaking. A space where anything could happen. And to rebuild the community that was becoming lost with the demise of Women in the Director’s Chair. So, uh, you know, a place for feminist artmaking grounded in media. And a place to explore the issues that inform women’s lives, from a variety of places, locations. So, I mean, I think that was it, really. And to feel, to feel free to have…so in that way it was kind of like, and I hadn’t really ever thought of it until this very moment, but at Women in the Director’s Chair, we had the youth project, the prison project, some of the same topic areas. 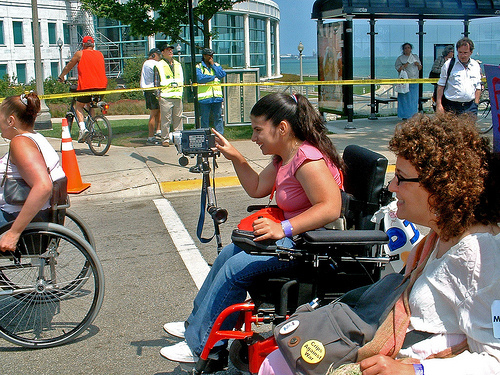 I got into some new topic areas through relationships that we were making along the way, like the disability rights movement through my relationship with Susan Nussbaum, but some of the early focus areas were really informed by both my international women’s movement experience and Women in the Director’s Chair. Also something that I had been developing both in my own personal practice and in my organizational practice over the 90s, was sharing my rudimentary skills with people that didn’t have them but would be interested in expressing themselves through media, for example, and people that were traditionally left out of these educational opportunities. SC: Dominican Republic, yeah. But also like working with the women in Grace House and working with the teen moms. So. DT: So these sort of projects that had video outcomes often included a process element that was sort of like, about skill-sharing. SC: I don’t think it’s either/or, I think it’s both, like, from an organizational perspective, I drove the shape because I was kind of making it happen. But it was very informed by the other projects on every level, from the people, the ideas we shared, and the things we made. And what happened to those things, and also like I was always really porous and influenced by the people I worked with. From the participants in the workshops, the people I worked with around activism or around artmaking, I was always really influenced by that. So I think like, maybe I was the spine, but there’s a whole body. DT: And who, who were some of those early “body” people? And I don’t, need you to get into comprehensive list-making of everyone who ever was employed by Beyondmedia, but who were the key figures? SC: Well, I would definitely say that Maria, although she was never a part of Beyondmedia formally, was a big influence. But, and then around the prison work, definitely Joanne. Romy Modlin, who’s a photographer from South Africa, she was involved in the early days, Dylan Mira, Kelly Noah, Zaida Sanabia, who had participated as a youth in one of our workshops, and Erica Meiners, Laurie Fuller and Fran Royster on the board level. DT: So, building off some of that, so, Dylan Mira for example is probably the reason that I first heard about Beyondmedia because I saw a video installation at the 2005 event Pilot TV Festival that was, that Beyondmedia produced. 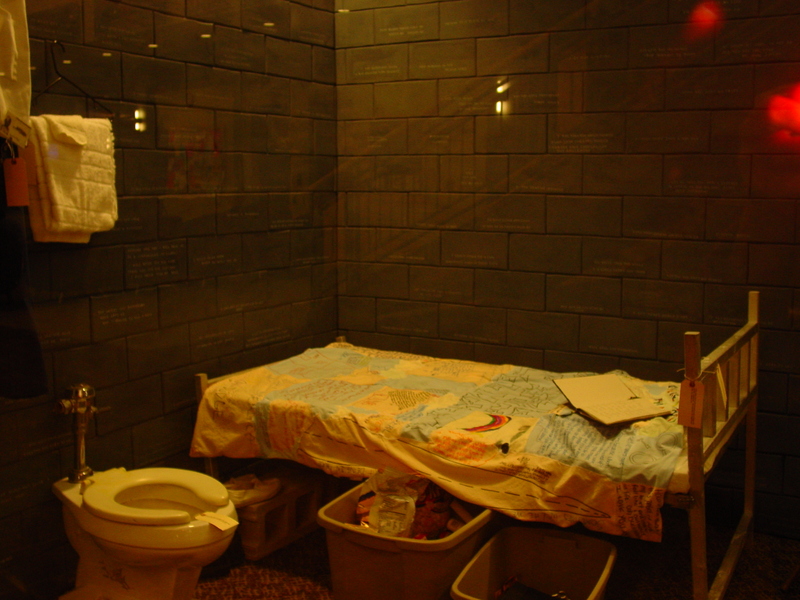 SC: Oh, the women and prison installation, Voice in Time: Lives in Limbo. DT: So that was my first exposure. DT: To Beyondmedia. And something that struck me when I first, and [Dylan Mira] was one of the organizers at that event, and something that struck me about the installation, kind of immediately, was that, I had this kind of association with “youth media” aesthetics, that were basically like the kinds of videos that are sort of produced in classes with the main focus being on technical skill development. DT: And then I look at the Women and Prison installation at Pilot TV and I’m like, wait a second, I think this is a youth media organization? That is my understanding of what this group is. But, this, the production value is much better, the overall, just sort of overall quality of the production is higher, and it’s more crafted in a way that’s sortalike, teens using, learning to use video cameras for the first time are not able to achieve. So I guess one thing I’m kind of wondering is that that was always something that I think Beyondmedia would get grouped in with the youth media landscape that was kind of like, that essentially emerged for the most part like kind of as a nonprofit kinda sector in the 90s and kinda rode this tech, the tech bubble, wave of funding, and is not nearly as sort of strong or prominent now as it was sort of ten years ago. And I guess, I’m wondering if you could kind of explain to what extent Beyondmedia kind of became a part of that world and that conversation and to what extent you were in some other stuff? SC: Yeah, it’s so interesting, it’s really interesting. I think it shows how the foundation world constructs the art world. It’s a perfect example. Beyondmedia started as a women’s organization. And very definitely the women in prison program only tangentially involved girls. It was really very much a women’s project. It’s very very very hard to fund women’s stuff, and particularly women’s media. Foundations don’t see why.. What’s the point of investing money in teaching a middle-aged woman, particularly one without a high school degree, high school diploma, to make movies? I mean, there’s no point in that, from an economic perspective, the way funders think. And so, to give older people access to public space and the skills to share public space, share public forums, was also not a goal that we could get funders to sign on to. So, we started, we got our first serious funding from Girl’s Best Friend, which was serving girls 18 and under, and that’s really what got us much more so into youth media. But, my passion has always been women, I have to say. I mean, I love working with girls and I enjoy it, tremendously, but my passion is working with women, particularly women that don’t see a future for themselves. So I guess all I want to say is, and also whenever we have worked with people, be it youth or women, the skill, I mean I love how you focus, use the word skill-building, or whatever, that was never our primary focus. Our primary focus was politicizing their issues. And creating public forums for, creating dialogues for these issues. And the media was really just, that’s where the name Beyondmedia, I guess, came from: the media was just a vehicle. It was never the end in and of itself. So teaching people how to make movies so they could do a PSA, that was never our intention, that was never my interest. So when we would do, for example, the Women and Prison installation, it was a collaboration between incarcerated and formerly incarcerated women, activists and art students. And that’s why all of our work has always been a collaboration, like the Empowered Fe Fes— it’s a collaboration of girls with disabilities from Access Living and art students and the staff of Beyondmedia. So. That’s why the work had, like, a more professional, not just look, ‘cause I think that it had a very, I don’t think the look was ever slick, by any means, but it was very playful and imperfect, it wasn’t at all slick. Handiwork was always present. But definitely the critical thinking that informed the work was what we valued the most. DT: And what kind of ended up being the balance, do you feel like, with sort of like, youth versus adult oriented kind of media production? SC: Like, statistical? Like, do you mean, numbers, the balance? I think it’s more programmatic and varied. Like, our Women and Prison program was pretty women-centered, though we also involved girls who were incarcerated at the Juvenile Temporary Detention Center. And then we had Girls! Action! Media!, which was solely focused on girls. And then we did, had a program called Q’d In Media, which was for queer youth. So I think, definitely, girls was our niche. We were the only media organization that really worked with girl-serving organizations to the extent that we did, in the number of girls and the kinds of programs we did. As I’m looking back over the programs we did. I think one of the, as I’m looking back over the history of Beyondmedia, I think one of the transitions that took place that maybe brought us to where we are now, is also financial, with funding. Funding.. is that, we began, early we were grounded in these very intensive, like, year-long projects that produced, with a small group of people, a rich process, really deep relationships, and a video. And then we stayed in collaboration to distribute the video, so we’d do public screenings, where the people involved in making the video would moderate the discussions and they’d go to sort of community-based settings, but also conferences and festivals and just a wide range of places. And as we were looking for increased funding, the problem we were encountering was we weren’t having direct impact on enough people. Like we were really, from our perspective, you know, we had a lot of young people coming through the organization as interns and staff members, and even if maybe there were only 16 Fe Fes in the workshop, for example, the movie was being screened internationally. Audiences all over the world were being affected, and people were developing new programs for girls with disabilities based on seeing the movie. So we were, we felt that there were circles of impact. But the larger audience impact wasn’t being valued by the funders. So we were being pushed into this place where we were doing shorter things, more things and shorter things—more projects and shorter projects—to impact more people. You know, workshops at conferences, for example, and one- to three-day workshops. I think that was a lot of the impetus for Chain of Change. 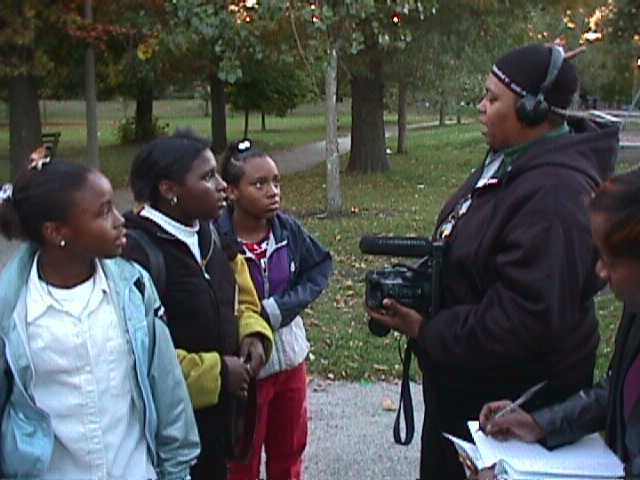 It wasn’t just that we were very interested in anti-violence work, because we were. If you look at all the projects produced by Beyondmedia, from the beginning of time, everything involved anti-violence and everything involved sexuality. So, I think the need to interface with more people on a regular basis is what took us away from this very in-depth intensive workshop process, project process, to this kinda more, I don’t want to say superficial, but I think I will. And it’s definitely, I loved those long-form workshops, and I really miss them. It’s very hard, by the time we evolved to where we were very recently, it was very hard to have those kinds of long-term intensive workshops and at the same time do the massive amount of work that we had committed to doing. SC: Yeah, it’s a.. one, I mean, there’s a lot of projects that I love, but there’s one in particular that answers your question, and it kinda gave me a jolt, because it made me question whether I was doing the right thing now. 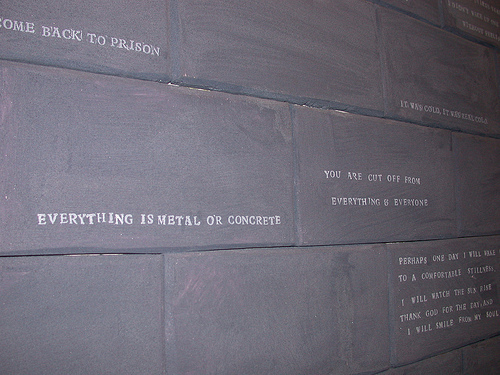 And it’s, for me I think it was the Women and Prison installation – 30 Days of Art & Education on Women’s Incarceration, and the follow-up iteration, Voices in Time: Lives in Limbo – because it was this place we created. I mean, I’ve always really valued face-to-face communication, coming together, and even with video, even with all the years of Women in the Director’s Chair, I loved the solo and group process of creating a piece. But I also loved the space of sharing the piece, like in a room. Not so much in a movie theater, but in a room, where people, like, talk afterward and look at each other. And you know, it’s just, and I always, the thing about making movies that’s always, that I love the most is that by holding the camera I get to talk to people that I would never in a million years have the opportunity to meet and get to know and become friends with. I’m really very human-connection driven. And yeah, and the media’s always just been a vehicle for that. Now, with the Women and Prison installation, first of all, it involved people from all these different places coming together to create the piece. It was, you know, art students, it was incarcerated and formerly-incarcerated women, it was scholars, it was activists, it was people in agencies serving formerly-incarcerated and incarcerated women, it was, I mean, you just can’t imagine the diversity of people that, you know not just economically or racially, not just culturally, but just.. what they did during the day, and how they, not just played out living their lives, but saw the living of life. So these people were involved in the making and then of course they and their worlds became involved in the sharing and the viewing and the conversations that ensued. And it was this very involved filmmaking and involved installation building and involved screenings and live performance. Formerly incarcerated women created a performance piece that would be played, that would be performed. We would have like this full cast of women that would do the performance at the opening night of each installation, and they’d have a conversation with the audience that was stunningly honest and open and direct. People would ask the most, I don’t know, sometimes out of the park questions, and the women were always just present to that experience. And I don’t know, it was the very best, for me, it was the very best of artmaking, because it involved skill and creativity and imagination and human interaction and learning and activism, and looking squarely at these problems that plague us as a society, and trying to think together about what to do about that. And you had all of these people in the same room. Thinking about that and talking about that. You had law school professors and prison guards and I don’t know, high school students, it was amazing. That, to me, was it. If I could do that forever, that’s what I would do. And I also love, I have to say, I loved making Turning a Corner (with Prostitution Alternatives Round Table) and I loved working with the Empowered Fe Fes, making Beyond Disability and Doin’ It. I love just working with people who are so clearly marginalized from media production, and you know, watching them make something that so clearly articulated a perspective that was not only missing in community dialogue but was incredibly persuasive and incredibly critical. You know, just really, they said things the way nobody else could say them. I love those projects too. SC: Yeah. And we kept moving, you know, renting the truck and moving it, and rebuilding it. It was kinda, it was very, the installation was very primitive in a certain way, we didn’t have flat screen TVs, we didn’t have, we built these kinda wooden frames to hold up these walls that were, the walls, the bricks were carved from foam, and everything was kinda hand-stamped. It was pretty kinda primitive, but it was pretty wonderful. DT: Do you remember the five venues? SC: Yeah I do. I remember all the venues for that. We opened at DePaul University Cultural Center, on the Lincoln Park campus, and we were at the Center for Inner City Studies, part of Northeastern, we were at Chase Gallery, which no longer exists, up in Rogers Park, Bethel Cultural Arts Center on the West Side, we were at Woodson Regional Library, at 95th and Halsted, and we went back there, two years later, and were there for like six weeks. That was an awesome venue because the installation was set up at the entrance, and they had like a thousand, 1500 people a day that would walk through that front door and everybody had to at least confront the installation. Everybody that came in. The women at the receiving desk, they said they were starting to get depressed, looking at the installation all day. And what would happen is people that would come to the first night, they would come back with a friend the second time, or bring a family member, or something. People would follow us from the first week to the last. And then another thrilling iteration of the installation was when we were at Las Manos Gallery in Andersonville for a month in 2004, so instead of varying the presentation by geographical location and venue type, we had a different topic area each week. So the first was race and gender in the prison system, the second was mothers and children in prison, the third was activism in the prison-industrial complex, and the fourth was re-entry. And each week would have an opening night panel that would include activists, scholars and artists. And there would be always a performance of some sort. We also exhibited and sold visual art and crafts made by women in prisons around the country, and we put the proceeds from the sales in their commissary accounts. And then we also had, we created a study guide, so we would have, schools would bring field trips, and we would have a formerly incarcerated woman there, talking to the kids and answering questions. And they would have a study guide that would take them through the installation, little activities that they had to complete. And that was all also pretty wonderful. I loved that one. Opening night, it was SRO with people waiting to get in, to talk about women and prison. DT: So, I guess there could be different counts of how long Beyondmedia existed, because you kind of had these sort of like multiphase beginning, but, after over a decade, you and, you reach a point where you step down as executive director and become artistic director. And then a year or so after that, there’s an announcement goes out to your community that is describing the decision to stop Beyondmedia as an organization, to cease to be an organization. SC: It wasn’t a year. I became artistic director in July, and then I went on sabbatical, and then the announcement was in December, so it was less than half a year. Happened very quickly. DT: And then a few months after there that there starts to be like, there’s a community meeting that’s called, kind of for friends and allies of the organization, to talk about how to kind of properly respectfully kind of conclude this organizational project. SC: Hm, yeah, uh, can I stop and correct you? So, I would say, what was left of the board that was involved with actually closing the organization, the two remaining members, never made a public announcement. That they.. what happened was they closed at the end of December – they sent me an email the week before they closed and the day after they told the other staff members, while I was in Brazil – and when I came back in January, is when the community meeting happened. So, the time period was much more compressed. So I think in certain, like, you’ve got the spirit of it, but the time is far more compressed. The new E.D. took over in July. By December they were closing. I was out of the conversation, but I think they had decided to close.. I think she decided to close as soon as she took over, but this is something I was told after the fact by others. And by the end of December it was closed. And then January 11th was the date of the meeting. So we rapidly formed like a transition board, and our email to the community to come to a meeting was, I think, the first public announcement. And it wasn’t even fully public, it was semi-public. As you may already know, the board of Beyondmedia has begun the process of dissolving the organization. We, the longtime staff, want to take this opportunity to draw on the support and wisdom of our community to discuss the situation. Please come to a meeting on Wednesday, January 11 at Las Manos Gallery, 5220 N. Clark St, Chicago. Please RSVP so we know how many people to plan for. If you can’t make the meeting but want to be updated, please let us know. DT: So, I guess something that I’m wondering based on that experience of sort of that rapid transition, is, what do you feel like you were able to take away in terms of insights into running an arts organization but that, what sort of parts of it, I don’t know, maybe this is—I was trying to think through this question a little bit. I know it’s not totally resolved, but what are some thoughts that you’ve had that are sort of insights over the last like six months or so as you see this organization that you worked on go though this dramatic transformation? You then also see this like quite significant community response that’s very supportive, and then go through a kind of messy process but where you’re sort of handing off the assets of the remaining resources of the organization to one of your ally friend groups, Insight Arts. SC: I have to say, I’ve always understood the professional nonprofit industrial complex as a concept. But now I really get it. And the.. there’s something, I think there’s something inherently unhealthy in organization as housed in the nonprofit sector. And yet, we have to live, we have to pay our rent. So you kind of find yourself moving into that place. But to have organizations that are run by, well they’re not actually run by boards, they’re run by staff and partners, and some board members take a real interest. But a lot of board members have little or no understanding of what you do or how to make properly informed decisions. And they have no skin in the game. And yet they end up with the power to decide the organization’s fate– In the case of Beyondmedia, even ignoring the strong advice of both our longtime banker and accountant. And, um, funders, though well intentioned, can add to the problem. Like, we had program grants for 2012 that had been secured in 2011, and the board got, the board and the E.D. got some funders to agree to convert these program grants to dissolution grants. So these, the money that was granted to support programs became the money to effectively close the organization and kill the programs– because, after closing the organization, the E.D. became the paid consultant to the board so the process dragged on and the checking account emptied out– even though Insight Arts had stepped up months before to assume the assets and programs. Insight Arts should have received those funds to continue the programs. And I think that funders feel they’re doing something good for an organization, they’re helping an organization that they have invested in all these years and they respect the work. And, for that very reason, one of our major funders paid off our line of credit and current bills, which made all the difference and we were extremely grateful. But funders don’t, because of the rules of engagement, feel they can talk to the staff to find out what’s really going on. So everything is, you know, this really fucked up process is cloaked in organizational process. So, I think that I became an artist in collaboration with other artists and emerging artists, in a very different environment– an environment that wasn’t an organization. It was, like a casual… We came together ‘cause we wanted to, we stayed together as long as we wanted to. And then we moved on or we didn’t, or our relationships morphed into something else. But once we became a nonprofit organization, the rules of engagement changed. And I would never do it again. I would never have a board again. I just know how to make friends and work with my friends, that’s all I know how to do. And then also.. there’s this fantasy that an organization exists without the people that make the work. I mean, granted, Girls Scouts or Boys and Girls Clubs or whatever, all of these organizations that started years and years and years ago, you know.. they continue on and the people that did the work in the early days are dead and the organizations go on, but there’s not just this.. it’s always a chain of people, passing on the work from one to the next, one to the next, one to the next. That’s how it works. Everything is always grounded in people, always, always, always. And this fantasy that there’s this organization that can exist devoid of people– it’s, it’s a fantasy that can only be produced by a mind that doesn’t do the work. DT: Can you appreciate why some organizations, or can you appreciate why some kind of work is sort of done by more formalized organizations? And do you kind of make a distinction between what kinds of things in a society, can be driven by informal groups versus more institutionalized organizations? SC: Oh, absolutely. I think it would be very hard to run an informal government. I think, although that seems to be what’s happening anyway. [chuckles] But I think, yeah, it’s not just the kind of work that determines how it should be created, I think it’s also the kinds of people, the people that are involved and how would they best interact, in what kinds of structures would they thrive and the work benefit? I think there’s room for all kinds of structures. I just find activities like strategic planning, and formal evaluation…and I don’t mean…let’s say you and I do work together, I mean, in a process, we’re going to be planning and evaluating all the time. And we have.. A scholar came to do a study of Beyondmedia in our final year. When she first came and sat in on a staff meeting, she said, “I can’t believe it! This meeting, it involves evaluation, planning, creating, reflecting, all of the things that are so formalized in so many settings are really just a part of your organic everyday process.” And that’s– you can’t move forward without reflecting and considering and how’re we going to change it and when and where, and with whom. But these, once people get paid to institutionalize these organic processes of collaboration, it takes on a different, you know, they become very cookie-cutter and they become rules of the game. And I, I have found that that’s not how I want to use my time. I have found that there are a lot of things about organization…that’s why I stepped away from Executive Director to Artistic Director. I mean, I loved going to work, I loved the people I worked with. You know we had, the people, the last group at Beyondmedia, Davey Ball, Joanne Archibald, Rebecca Connie, Lauren La Rose, Zaida Sanabia, Ronit Bezalel, Tiara Epps, Marissa Faustini, Kris BD and Madsen Minax and other youth, I mean, these were people I had been working with for years, and they were, we loved going to work. I mean, I remember once when Simon Strikeback.. we were sitting at the table eating lunch or whatever, and he said, “you know, I can’t believe this is my job. I can’t believe I come here and I get paid to do this.” And that’s how we used to feel. We were grateful. But I also found that the ways that I was using– and that was the seduction– I loved being there and I loved partnering with the people we partnered with and I loved thinking about the issues we thought about, but a lot of the ways that I was using my days was not the best use of my time and skills. So that’s why I wanted to transition to artistic director and become more of a, do more of that work that I did at the beginning. But, can I just say, I have time for my own work now. And I’m engaged in a number of different projects that are really exciting. I just finished a feature-length documentary with Jerzy Rose and my son, Jesse Wheeler– Brink of Survival, shot on location in Malawi between 2009 and 2010, and I’m sending it out to festivals. And I am working with my old friend, Susan Nussbaum, and several others on Code of the Freaks, which is a snarky, funny documentary project about images of disability in Hollywood cinema. I am also doing a piece on restorative justice with Community Justice for Youth Institute. I am writing an original script, a mock-u-fantasy for a web series with my husband, Brad Newton. And I am setting up a production company, Personal Hermitage Productions. My collaborations are all relationships that were built over the course of Beyondmedia, even before then, in some cases. This is what I most value.